So, you’ve got a day to visit Mount St. Helens. Huzzah! All right, if you don’t now, you will someday, quite possibly maybe, and you’ll want to know how you can do All The Things when you haven’t got much time. Never fear! In response to a request from Silver Fox, I’m putting together your very own field trip guide, which will show you things you can do in a day there, and feel you got your visit’s worth. Keeping in mind, this is a Pacific Northwest summer day and so it is very, very long. First, download Roadside Geology of Mount St. Helens National Volcanic Monument and Vicinity by Patrick Pringle. You can print it out or take it on a tablet, but don’t leave home without it! Now that you’re wound up and ready for adventure, start up Highway 504 – Spirit Lake Highway. Crusing along with a passenger who can read bits from Pringle’s book, you’ll see quite a lot of geology even before you get to our first stop – Mount St. Helens and the Toutle River Valley have a long history. Evidence of the area’s dramatic past will pop out at you all the way along. Optional beginning: Mount St. Helens Visitor Center at Silver Lake. For you strange people who like to get a super-early start, this is a nice place to get oriented. It’s got many lovely displays, some handy and inexpensive guide books, and a great little walk along and over Silver Lake, which was created by a lahar that dammed Outlet Creek 2,500 years ago. 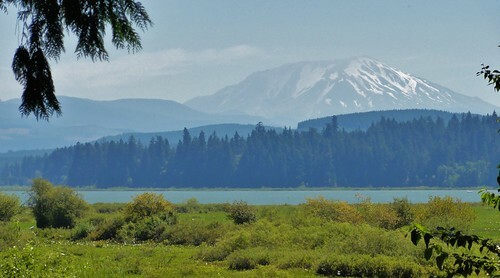 On a clear day, you will have a lovely if distant view of Mount St. Helens, 30 miles up the valley. Mount St. Helens with Silver Lake in the foreground. If, on the other hand, you’re driving in from Seattle, Portland or similar and arrive late in the morning, skip ahead to our first official stop. Mount St. Helens from Hoffstadt Bluffs Visitor Center. We’re about 15 miles (25 kilometers) downstream from Mount St. Helens here. The Toutle River is a braided channel weaving its way through lots and lots of sediment, carrying lots and lots more sediment. If you’ve got sharp eyes, you’ll see the remains of the N-1 dam, built to retain some of that sediment. Unfortunately, it failed to retain a rather large 1982 lahar, and winter storms and floods finished off what was left of it. A new, larger, and simply awesome sediment retention structure was built later (if you’ve got time left over, you can make a short side trip over to marvel at it – delightful little walk, nice engineering, and in certain seasons, you can nibble some delicious oxalis). The remains of N-1 mark the edge of the debris avalanche, which we will be getting to know intimately later today. But most of what you’re seeing here are older volcanics – Spud Mountain (the rather pointy peak in front of St. Helens in the above photo) and the other mountains hereabouts are far older than our active youngster – they’re around 36 million years old, whereas St. Helens clocks in at around 40,000. You’ll see the occasional bedrock outcrop. If you could get up there, you’d also find, somewhere beneath all the biology, evidence of glaciers that mantled this area, some of which came and went before the Puget Lobe of the Cordilleran Ice Sheet was so much as a gleam in the Cordilleran’s ice. River terraces reveal evidence of pre-1980 lahars that roared down from the mountain in more recent times. Put it like this: this area has a long and exciting history, one that makes reading quad map documentation epic. Not even kidding. Once you’ve had your fill of scenery, a short wander down a trail near the Visitor Center will take you to the Memorial Grove planted in memory of the people who died in the May 1980 eruption. Don’t worry if you don’t get a chance to pay your respects here – you’ll get a second chance at the end of the trip. When you continue on, you’ll soon be entering the blast zone…. 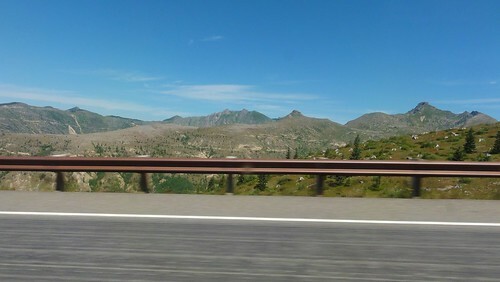 Photo on the road, within the Blast Zone. By the time I get to MSH, I’ll know so much about it, I won’t need a guide. Nope, wrong, I’ll still need a guide because how could I go without Dana in the first place??? But she’ll point to things and I’ll be all “Yes, I recognize that! Now tell me more about it!” It’ll be awesome. I’m not kidding when I tell you they have the absolute best ranch I have ever tasted. The “absolute best ranch” what. Ranch dressing? Ranch coffee? Ranch chicken wings (blue cheese is better)? I assume Ranch Dressing. Which, to me, is like saying “best Wonder Bread”. But should I get down that way, I will try it, just on Dana’s recommendation. Heathen. Ranch Dressing is the dressing of all dressings. And if they have the best, well, then it is the Ranch Dressing of ALL Ranch Dressings!! Much as I know that MSH and area are beautiful and geologically interesting I can’t think about it without a feeling of dread. I was just weeks from my 14th birthday and only four months post my father’s death when it blew. Those memories are still powerful in a way that they might not be had I not been literally face to face with death just four months before. I felt on a very visceral level the extinction of those 57 people, and I still do every time I’m reminded of it. Death was already more real to me than to most 14 year olds living in such a privileged part of the world. How could it not be, given the body, the ambulance crew: “Christ, he’s cold. How long’s he been here?” and the funeral? But on May 18th 1980 it became more. It became as solid and undeniable as the ash we collected off our car. Mount Saint Helens taught me that death was everywhere, waiting, and it took a long, long time for me to be okay with that. Someday I’ll have to go there. Go see for myself the beauty, first hand. Go see the life in all it’s wondrous forms that’s grown back these last 34 years. Death always wins the war, always. But if I could go and feel joy in a place so bound up in dread, well, I’d call that a victory. Ah crap, I just noticed the ‘a bit o’ fun’ tag on this post. Feel free to delete my downer of a comment. No, you need to read Dana’s whole series on MSH, Prelude to a Catastrophe. Just not, you know, when feeling particularly down. When in a disaster-movie mood. Very, very interesting stuff in that series! FossilFishy, I wouldn’t delete it for the world! Well, not unless it was a reality quality world and you were shouting in my ear, “Delete the comment, doofus, they’re offering a whole entire world!” But even then, even after we’d all settled in to our brand-new world and were sipping drinks on its sparkling beaches, I’d never forget. When you’re ready to see that beautiful and terrible mountain, look me up, and we’ll go. Awwww! I’m gonna get off me arse and continue, too, I promise! Just got a few last trips to take, then it’s all work all winter. *blush* Thankees! Never woulda happened without you! Thank you Dana, that’s an uncommonly kind offer. I now live in Australia, but one day I hope to take my daughter to see the Pacific Northwest seeing as how she’s half Canadian. Camping under the Southern Cross and Milky Way with the smell of Eucalyptus everywhere is all very nice, but nothing beats a cedar-wood fire and the wind in the conifers. (Despite having to chop, chop, chop to keep the fire going.) I might just take you up on that should I ever be able to afford to do it. Until I read your OP it never occurred to me that I could go there and put a modern face on an ancient dread. To be honest, it’s probably not essential. Though it took a “long, long time” I did finally come to terms with in the inevitability of death. On the other hand, the strange sense of peace I get from simply contemplating that trip likely means it’d be beneficial….blargh, all this emotion stuff is so damn complicated. Enough. Thanks for the offer, the post and the free therapy. You rock in a protolith devouring metamorphic kinda way. Nope, nothing to see here! Now that, I will agree with.